I have always had a fascination with horses. When I was growing up I took horse riding lessons, and my father even purchases a farm where we housed a few thoroughbreds, a pony and a quarter horse. He bought a carriage and we went on carriage rides up and down the streets. I truly enjoyed the time spent there, and I’ll never forget, Penny, my copper colored horse. For me, horse riding, and Penny were a hobby, my pet. I didn’t know much about taking care of a horse, besides brushing her down and feeding her treats. Recently I had the pleasure of reading a wonderful book that took me back in time, an adventure right into the heart of horses, racing and history. Some of my favorite things! Back Cover Blurb from the press release… In 18th century England and Colonial Virginia, when high-spirited stallions filled the stables of the lords and fortunes were won (and lost) on the outcome of a race, a love story unfolds between Charlotte, a young woman for whom her uncle’s horses are her only friends and Robert, the young man who teaches her everything about their care and racing. When she’s forced into marriage, his only hope of winning her back is to race his horse to reclaim all that was stolen from him--his land, his dignity, and his love. Although, I will admit, at times I found myself cheering for poor Philip, our illustrious rake/villain. Boy, did he go through the ringer too! And although he was a bit selfish, he did make a lot of sacrifices, and led a hard life, and I hoped in the end he would have had some appeasement. I do have a soft spot for the bad boys… and Philip was one of those I’d hope would reform, and in some ways I felt he did. Who knows maybe, Philip will get his own story? Lee goes into a great detail about the care of horses, and her knowledge of horse racing and breeding was astounding! A lot of hard work and research went into this rich story, which I truly admire and appreciate. I also relished how she incorporated real life characters, horses from the past, races, political events, wars, the culture, into The Highest Stakes. For myself, when I read a historical novel, I truly rejoice when the author grabs the essence of the time and setting and paints it onto the pages of their books. Lee is definitely an author to watch! Don’t forget! Ms. Lee will be guest blogging here on History Undressed this Wednesday, April 7th! Make sure to stop by for your chance to win a copy of the novel, two winners will be chosen! I am very excited about this book. 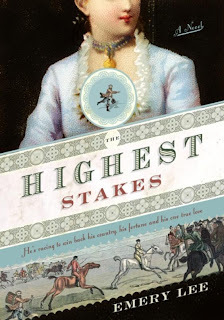 I have always been interested in horses and I love that this book isn't set in your typical historical fiction venue. Great review. You will love it dolleygurl! This is a great blog! I'm going to link it to mine http://sofaithfulaheart.blogspot.com/ because I think my readers will really enjoy it, too. I'll be back!